I’m actually very pleased this week because I didn’t get many books! I know that sounds crazy but I think it’s the first week in ages I haven’t bought anything. All the Truth That’s in Me by Julie Berry- I’ve already read this one and really enjoyed it. Review coming soon! Thank you, Templar! 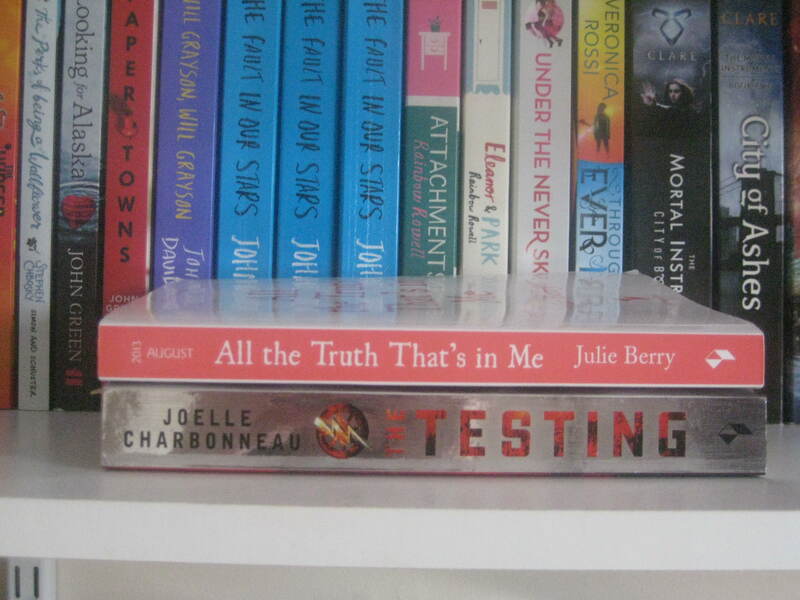 The Testing by Joelle Charbonneau- I’m currently reading this and it’s a bit iffy. I love the cover, though! Thank you, Templar! Wild Cards by Simone Elkeles- This sounds so good and I haven’t read anything by Simone Elkeles. I’m looking forward to starting it. Thank you, Bloomsbury! Resist by Sarah Crossan- I let out a little squee when I got the email to say I’d been accepted to review this. I enjoyed Breathe and really want to know what happens next. Thank you, Bloomsbury! 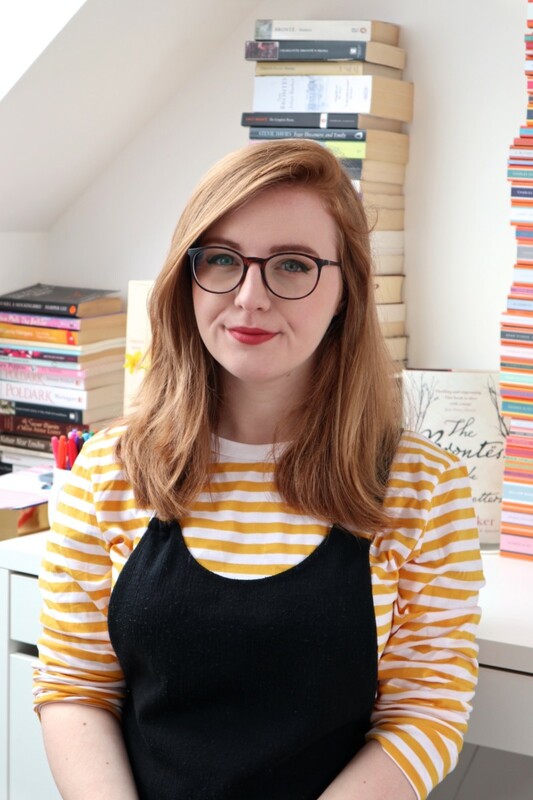 Rachel @ Booktastic Reviews recently posted…Interview with Book Blogger, Rebecca! I thought Breathe was really good and the cover is so pretty! I really liked All the Truth That’s in Me and love the UK cover for it. Glad to see you liked it too. I’m ridiculously excited for Wild Cards as I’m a huge fan of Simone Elkeles. You should read Perfect Chemistry as well! Omg I got Resist too and I’m SO EXCITED OMG! It looks so good and I loved Breathe too, I’m really glad that you enjoyed All The Truth That’s in Me I’m reading that one really soon 🙂 Wild Cards also looks good, too, I haven’t read any Simone Elkeles, either, but I’ve heard good things. Nice haul of books. I see that you got some good books. Heard good things about The Testing. Following via bloglovin. Jess Hearts Books recently posted…Letterbox Love (31) A Quick Catch-Up! Both the books look really good and I still need to read Breathe 🙂 Great haul! I got Resist too, I love the cover too. Bloomsbury made my day. I hope The Testing gets better for you, I’ve got it to read too! All The Truth Thats In Me looks awesome too- happy reading! The Testing and Wild Cards both sound good to me, I hope you like them! Awesome haul! I’ve heard such fantastic things about The Testing. It has been compared to The Hunger Games which makes me want to read it even more. I hope you enjoy all of your books! I’m really excited to read All the Truth. It looks so good. I’m glad to hear you enjoyed it. Great haul! Happy reading! I hope you like Wild Cards! Simone Elkeles is one of my favorite authors, and I just love her novels. I’ve heard her latest one isn’t as good as all the rest, though, so if you aren’t wowed by it, I would strongly suggest reading Perfect Chemistry or Leaving Paradise. I don’t do Stacking the Shelves often, so mine is for all of August so far. Kaitlin recently posted…It’s a Stacking the Shelves Post! I”m glad to see that you enjoyed All the Truth That’s in Me! I’ll be looking forward to your review. And hopefully I’ll be able to read Wild Cards and Resist soon! Happy reading, darling! The Testing was really good, I enjoyed it a lot. I hope you do, too! O__O You have THREE copies of TFiOS? And I thought I was cray-cray with my three dif. versions (audio, ebook and pb) of TFiOS. LOL. I also got Wild Cards for review (well actually tour)- I hope it’s better than Perfect Chemistry. I love the sound of All the Truth That’s In Me! I’ve been wanting to check it out for a while. I’ve been wanting to check out The Testing for a while, I hope it picks up for you soon! Wild Cards will be my first Simone Elkeles book too! Lucy, does that happen to be your bookshelf in the background? Lol how come you have 3 copies of TFIOS? I’m a curious cat, sorry. Anyway, awesome haul! I’ve been hearing many great things about All The Truth That’s In Me! Wish I had a copy so I could read it too! And did you just say you haven’t read any Elkeles book? *GASP* You must read Perfect Chemistry! In other news, I have Wild Cards too and I’m so excited to read it I kinda have a crush on the guy on the cover! YOU HAVE RESIST? I just requested a copy on NetGalley and am waiting, pretty impatiently to find out whether or not I get accepted. I just adored Breathe! Sophie Louise recently posted…Guest Post: Top 5 Books of 2013 with Amber! I got Resist too! Though, I have to read Breathe first. The Testing sounds good, too. Enjoy! All the Truth That’s In Me is good? That’s surprising, I guess I have to check out my ARC of it right away.